As a thank you to everyone who participated in our FIRST challenge at Crafting for all Seasons. Some of the DT's have posted Giveaways on their individual blogs. In order to win our different blog candies you need to go to each of our blogs and follow the rules for each DT's candy. Enter as many of the DT's giveaways or as few as you like. My blog candy is SIX digital images from Some Odd Girl Stamps. 3. please add your link below. I will announce the winner on June 15 on my blog and on the Crafting for all Seasons blog. 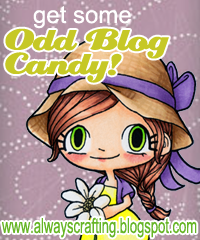 Please check out the other DT's blogs listed below for a chance to win their blog candy. Wonderful candy! Thanks so much for the chance to win! Thanks for the chance. I also have some candy, come by and check it out.